Frederic Mullally is unimpressed by Channel Four’s Mosley series. Having had a preview of the programmes, he is adamant that they do not present Mosley as he really was. The bestselling author should know, as he was a Fleet Street journalist who wrote about the fascists as they attempted their postwar revival. 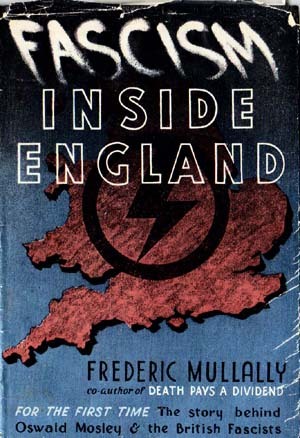 His book, Fascism inside England, written in 1946 while he was assistant editor of Tribune, was a classic in its day and stands the test of time as an excellent exposé of Mosley’s Blackshirt movement. Steve Silver talked to Mullally about what it was like to see Mosley’s fascist movement close up, and why he issued them with his own personal challenge. As a teenager Mullally attended the infamous fascist meeting at Olympia where hecklers were severely beaten. Even though he was both “appalled and excited” by that event, he does not identify this as the incident which really aroused him to actively oppose fascism through his writing. Fascinated by India, Mullally had earned enough money to pay for his passage there, where he went through a couple of journalist jobs before becoming the editor of the Sunday Standard in Bombay. At only 19 he was probably the youngest ever editor of a national newspaper. It was his return to England in1939 from Bombay via Antwerp on a German boat that really had the strongest effect on him. “I was amazed and stunned to find that every member of the crew were Nazis. They would play the Horst Wessel Lied and Deutschland Über Alles on the ship’s radio regularly in the morning and at night-time.” He developed a rapport with the radio operator, who tried to convert Mullally to Nazism. His discussions with supporters of the Nazi Party, and, after his arrival back in England, his discovery of the Jew-baiting by Mosley’s fascists in east London focused his mind on the fascist threat. There was one thing about which his journey had left him in no doubt: that war was imminent. The reduced fascist activity during the war, because Mosley and other fascists had been interned under Regulation 18B as potential agents of an enemy power, largely removed the fascists from the public eye. However, in spite of their imprisonment and the revelation that millions had been exterminated in the name of their creed, many remained unrepentant.As soon as the war ended the fascists retrieved the membership lists that they had hidden before they had been outlawed and started to organise. 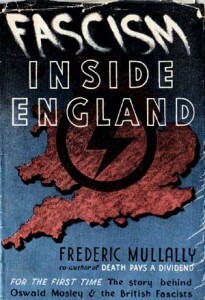 At the time that the fascists were staging their postwar comeback, Mullally was a journalist on the popular tabloid, the Sunday Pictorial, writing a political column called “Candid Commentary”. One Sunday night, in August 1947, he visited Ridley Road in Dalston, east London and was sickened by what he saw. Thinking back, he says it was agreat shock to see the fascists describing Mosley as “the greatest living Englishman”. In his column, he described what he had seen at that fascist meeting. That Sunday morning, Mullally received a phone call from Geoffrey Bernerd, the chairman of the anti-fascist ex-servicemen’s organisation, the 43 Group. Bernerd offered to provide him with bodyguards, as to go into the Ridley Road area unprotected would put him in great danger. Mullally declined the offer and made his own way to Dalston. It seems incredible that he went unaccompanied, but he says that he was a journalist on a Fleet Street newspaper wanting only ten minutes on their platform and thought he could get away with it. In fact, at first it seemed as if he may have been right. The fascist meeting that day was in John Campbell Road, as the Communist Party had taken the pitch at nearby Ridley Road before the fascists could get there. Mullally parked his car and walked towards the platform. The police were out in force, the Sunday Pictorial had five million sales, and perhaps twice as many readers, so his article had attracted much attention. Two hundred police officers were assembled and they cleared a pathway for Mullally to get through the crowd to the platform. The crowd of more than a thousand comprised fascists around the platform, with anti-fascists further back. As Mullally made his way through the outskirts of the crowd all he could hear was “We want Mullally, We want Mullally”. Nearer the platform the chant changed to “We want Mosley”. Even though the police had linked arms to create a path for Mullally, as he got deeper into the fascist crowd they came at him through the police line, punching and kicking. At one point Mullally went down under the blows. The 43 Group escorted Mullally across Kingsland Road into Sandringham Street,where they had put up their own platform. This was a small meeting because the police were holding the crowd back in John Campbell Street. Shortly afterwards the police closed down the 43 Group meeting as they attempted to contain the situation. The 43 Group then took Mullally into Ridley Road to the Communist Party platform –the roof of a loudspeaker car. This was an even smaller meeting as most people were in John Campbell Street. As he was about to be helped up onto the roof to speak, he heard the sound of a Nazi song and the tramping of feet. Then some 200 Blackshirts charged at Mullally’s small group. The fighting went on for quite awhile and the anti-fascists were heavily outnumbered.The Communists’ car was smashed up. Mullally grins as he recalls that his strongest image of that moment is of “this good old anti-fascist woman on top of the platform with a large bar in her hands smacking down anyone who came at her”. The 43 Group then took Mullally into a pub and locked the doors. A few stayed with him while the rest rejoined the fray. He has no doubt that the 43 Group saved his life. The fighting had now spread up and down Kingsland Road and mounted police went in to clear the area. Glad to have got away safely,Mullally probably did not expect to go back to Dalston too quickly. But the following Sunday he received another phone call from Geoffrey Bernerd, who told him that the 43 Group had held a platform in Ridley Road since early in the morning and wanted Mullally to speak that night. There had been an all-London anti-fascist callout of every group and they were confident that this time they would rout the fascists. A 50-strong group met him at Dalston station; this time he accepted the bodyguards. Mullally addressed a large rally in Ridley Road, which was a complete reversal of the previous week’s meeting. This time the fascists were on the fringes of a large anti-fascist meeting. After that the Mosleyites never again had sovereign rights in the area. Hamm went on to write a bitter pamphlet about the events called The Battle of Ridley Road. After Ridley Road, Mullally addressed various meetings of groups, including the Jewish organisation Maccabi, on topics such as “antisemitism, the gentile problem” and continued to attack the fascists in his column. In 1954 he moved away from political journalism with his first novel, Danse Macabre, which was the first of many bestsellers. Eighty this year, he is currently working on a new novel, his twentieth book. Some of his books have been translated into other languages, and one, Clancy, was made into a five-part series for television. Mullally points out that you only had to see Mosley’s followers to see what he was doing. He quite deliberately went out to attract the lumpen-proletariat in London’s East End because he could attract them on a racial basis, on prejudice and hatred rather than through intellectual argument. When Mullally was actively opposing the fascists a bullet was fired into his house. The following morning he received another bullet through the post, wrapped in a note saying “there’s plenty more where this came from”. Postscript 2010. Frederic Mullally has his own website which details his fascinating career. You can visit it here.